From icy city pavements to slippery river beds, the redesigned FreeSteps6 offers durable, ultra-light traction performance to those needing a simple anti-slip aid for outdoor activities. Utilizing high-quality stainless steel chains and spikes, the new FreeSteps6 is a solid choice to support your active life style. * Spike length: 0.8cm / 1/4? * Hillsound’s FreeSteps6 are the ideal traction device for a variety of activities including city walking, light hiking, ice fishing and trail running. * The minimalist spike design means that you can comfortably wear the FreeSteps6 for an extended time, even when standing on hard surfaces. * For winter use, the 21 spikes provide grip on a wide range of terrain- from ice to packed snow. * For anglers, the eco-friendly FreeSteps6 provides secure grip on rocks and river slime and does not transfer invasive aquactic species when rinsed after use. * Elastomer harness adapts to all types of footwear, fits securely and is easy to slip on and off quickly.These cleats also provide additional traction on muddy and slippery river beds for anglers. * Ultra-light traction for trail runners conscious of carrying extra ounces. 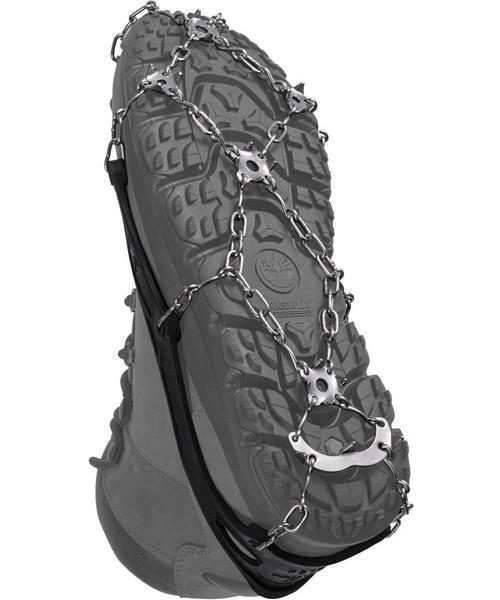 * Larger spike plate at the crampon heel provides better traction on downhill slopes. * Reinforced elastomer harness provides tear resistance and maintains pliability to sub-freezing temperatures. Free Steps 6 is rated 4.6 out of 5 by 5. Rated 4 out of 5 by Kailey87 from great addition to my winter gear I have used these 5 times now, and love them. They're great for icy conditions - I can hike the icy stairs of The Chief in the winter without slipping. The only drawbacks I've noticed so far is that they can be a bit tight on my feet after several hours of hiking. My boyfriend has a pair also, and one of the metal links on his bent apart - easy to fix with a pair of pliers though. They're easy to get on/off, good quality overall. Rated 4 out of 5 by wolfric from No more falling Our winters have changed (Montreal) fluctuating conditions brought about ice rain, rain, re-freeze, making walking conditions very hazardous. The free-step 6 ( would re-name; no fear step), is simply a MUST. Rated 5 out of 5 by thatcrazyhiker from highly recommend I am so happy to have purchased these. I have used them for muddy, slippery, slopy, icy, and snowy trails in the past 8 weeks and they have helped my stay on my feet in all conditions. Rated 5 out of 5 by Nelsoncamper from Work great I bought these last month for walking in icy conditions and hard packed snow. Love them! Haven't slipped once, even going uphill. Easy to put on.